Notes: Menu buttons from left to right: Normal Test, Custom Test, Exit. After selecting test, click the leftmost button on the new window to start benchmark. Also known as "Uncharted Waters Online." 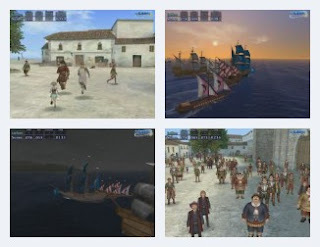 Daikoukai Jidai Online is a maritime MMO, where the player explores the vast seas for treasure, profit or piracy. The original in the Daikoukai Jidai series was published in 1991. The benchmark runs three scenes: Land (buildings), Sea (ships) and Character. Most interesting is Sea, with nice water, a sunset and a ship battle, but even that is boring. Sleep-inducing music. Camera work dull. Long running time. Not recommended.